[mine] creative space and art gallery will play host to a prominent London art group's fine art fair this month, for just one week only. This will be a unique opportunity to view and buy a large collection of affordable fine art by ten diverse London artists. 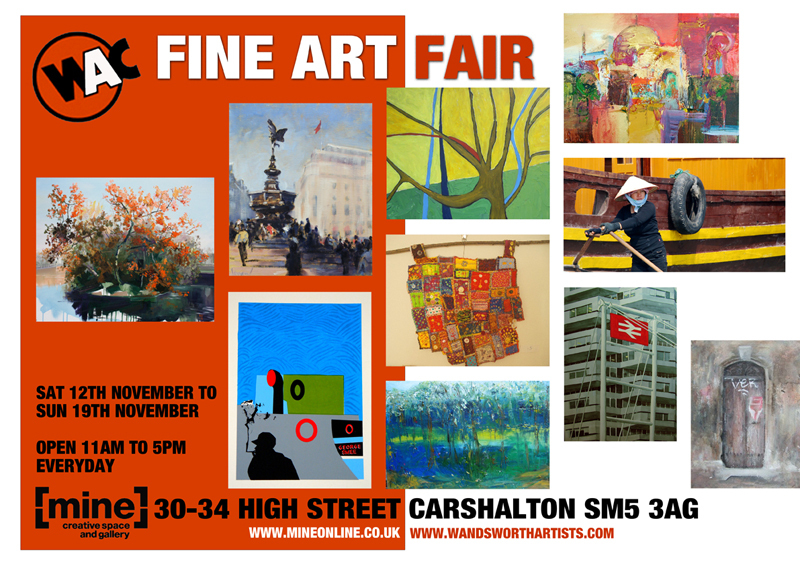 The exhibition is the work of The Wandsworth Artists Cooperative and will be on show at the popular Mine Gallery, in Carshalton High Street. photographs and textiles, celebrating the breadth of talent in the South London art scene. The Wandsworth Artists Cooperative have had a very successful run of individual and collective exhibitions and wish to continue this success in Carshalton. A view across the work shows a wide range of styles and effects, from the abstract to the more traditional. Linda Howell, Neal Vaughan, Jim Hanlon, Anna Martin, Julie Higgins, Bruce St Julian Brown, Eileen St Julian Brown, Diane Whyte, Judy Copestake and Martin Ireland. unrestricted in the surrounding roads.